Click for SC2ITL Liquipedia which contains all upcoming matches, played match results and current standings. The SC2Improve Team League has been taking place for 7 weeks now and we are currently in a break period before we start again with the action for Week 8 of the Round Robin Stage. There has been a lot of upsets, many great games and surprisingly very few drop outs so far in the tournament! So let's take a look at what has been happening! Before we begin let's remind ourselves what these teams are competing for the in the SC2ITL! Top 3 of each group advanced in the Playoffs. First place receive a BYE in the RO16 of the play-off bracket. Second and third places will be placed against teams from other groups in the RO16. The winner takes home €175 and 5 x ZOWIE MiCOs, while second place takes €75 and 5 x ZOWIE G-CMs. Once again a big thank you to ZOWIE GEAR for supplying the ZOWIE products to add to the prize pool. Let's take a look at how the groups are looking after 7 weeks of competition! When the groups were drawn everybody who fell into Group A let out a small sigh of grief, while for everyone in Groups B, C & D it was a sigh of relief. Group A featured a huge stack of great teams and everybody knew that getting out of this group at all would be an achievement. mYinsanity were probably one of the most well known teams to join the league. With recent additions of Jjakji and Kane to their line-up everybody knew it was going to be no small task to take the first place throne from them. They have dropped some maps - but mostly when using their non-all-star players. When things get tight they aren't afraid to send out Kane or Jjakji to clean up and bring the victory home. So it comes to no surprise that they stand at the top of the table with a 7-0 match score. They play smart tactics - sending out their lesser known players first to give them experience before using their aces if they are needed. In Week 8 mYinsanity play against Cascade, who are perhaps their closest rival to knocking them from the top spot. Cascade were looking great until Week 7, where they missed their match and lost their un-beaten streak to International Division - a team who shouldn't have been a challenge for them. It changes the consequences of the Week 8 match outcome significantly. Beforehand Cascade could either Win and basically secures themselves the first place, or lose and still have good control over second place in the group. Now however, they must win if they want to have a chance at first place and avoid falling into the scrap of teams battling for third place - giving up their solidified second place. Cascade vs mYinsanity is going to be the match of Week 8 - keep your eyes out for it! The battle for third place is a scrappy one with the stack of teams we see in Group A. Karnage eSports, MaxFloPlay, Reason Gaming and Love Your Girlfriend have all been trading wins with each other. Internation Division have the hardest run ahead of them, with a lot of top teams to face still. Love Your Girlfriend are perhaps in the best situation here - with their matches vs Cascade and mYinsanity already out of the way they have a fairly clear run to the end and good chances of slotting into that second or third place. It won't be easy though - they will have to win every match they have - but with new additions to their team such as Genius, Tassadar and ex-SKT1 players their chances are looking extremely good. Karnage eSports could stand in their way as they play in Week 11, but if they can't do the damage they might end up being the team which allows LYGF to go on the winning streak they need to move ahead. 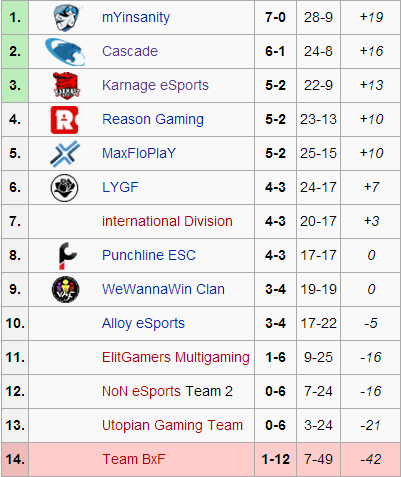 The fate of Reason Gaming and MaxFloPlay are mostly in the hands of Karnage and the middle of the group teams - especially as they still look to go up against each other, mYinsanity and Cascade. The battle for third place in Group A is something which may very well change drastically right up until the final Week of the Round Robin - so make sure to keep your eyes on this storyline if not any other. Group B looks a little incomplete currently - with a lot of matches currently being played in the catch-up period it's a little bit harder to understand what exactly is going on. But some things at least are clear. There is again at least some definite front runners to Group B. AT-Gaming currently lead with a 7-0, 28-12 record. Undefeated they stand at the top of the group - though it hasn't be an easy ride. They have had some close calls, specifically only just clinching victory with a 4-3 scoreline over Starcraft Freaks and Quality Control. However their depth of GM players and their ace uThermal has managed to pull them through this far. With Russian Elite Guardians yet to play vs AT-Gaming and KnightS* anything could happen in the coming weeks. The top of Group B is not set in stone as heavily as Group A.
Russian Elite Guardians despite the image are also 7-0. Their first week loss vs Epical Hero got disputed and will result in a win for REG, which will be amended at the end of the Season. The Russians have been showing a surprising amount of skill and for being one of the lesser known teams in the league they are showing how deadly they can be. KnightS* Gaming sit in third place with one less match played than first and second. Having only lost so far to AT-Gaming it looks as though KnightS* have definitely come with the idea of securing a spot in the playoffs. The Dutch team are the Dutch Starcraft Team League Champions - and they are hear to show us that title never came easily. The middle of the group isn't quite as exciting as in Group A - by and large due to the missing games it is difficult to judge where everyone is. Team Xperience currently sit in 4th place, but with only 5 games played they could very well end up in 3rd or 7th by the end of catch-up week. Starcraft Freaks Clan are perhaps one of the larger surprises and have just come short so many times. With a 3-4 loss to AT-Gaming at the start of the Season things looked like they would go well for them - but instead they ended up losing to teams 4-2 and 4-3 too often. A comeback from this position to playoffs is almost impossible for them unfortunately. The rest of the group is pretty well set in the middle. With games that could be won or lost in catch-up week they standings may change slightly, but nothing too drastic will prevail. Group C Standings - and you thought Group A was close? Group C is just ridiculous. When you first look at it there are some teams you may recognise such as ESC ICYBOX, eSuba and Missing In Action. Currently only one of these teams sits in a position to advance to the playoffs - though the others are not far behind. Nuit Blanche lead Group C and are currently undefeated, even after playing teams such as eSuba and ESC ICYBOX. Honestly, Nuit Blanche are not a team I had heard of when I first received their application to play in the SC2ITL. By Week 3 it was obvious I needed to know who these guys are. It might surprise you that they don't have any players who hit you in the face as 'Oh! That's who they have!'. They simply have a strong line-up of multiple GMs and high-master players. Turns out with some good performances that is all you need to have a solid run in multiple team leagues - as their results show numerous top 3 finishes. With the position they are in it's going to take a disaster for Nuit Blanche to fall short of the playoffs. The next few positions could go any which way by the end of catch-up week. Missing In Action, Team DarkStar, eSuba and Team Spectre all have one match to catch-up on, which can shuffle the current standings around a lot. Missing In Action looked solid until the last 3 weeks - from only 4-0 and 4-1 victories to a 3-4 defeat and a 4-3 victory it looks as though they have been pushed a little off of their step. Again, many of the top teams in the Group still have to play each other in the second half of the season - so nothing is determined yet - but Missing In Action will definitely be looking for that top 3 finish - if not even better if they can derail Nuit Blanche slightly in Week 11. Team Darkstar have had a fantastic run so far. The Swedish team is definitely a group to keep your eyes on as with recent pick-ups their line-up gets stronger and stronger. However they have a long way to go in the SC2ITL - 5 of their 7 remaining matches are against those who currently sit in the top half of the table. Their current playoff position is heavily under threat from many teams hungry for victory - but will they be able to fend them off and hold on? ESC ICYBOX and eSuba are two teams who you might expect to be right at the top of the group. And let's be fair, they are. eSuba more-so - with only a single loss so far (against the Groups leaders) they have the potential to skyrocket further and further forwards in the second half of the season. ESC ICYBOX tread dangerously currently. A 5-2 scoreline is solid - but with Group C being so close they are only one or two losses away from missing the playoffs stage - which is something nobody expected to see. Team Spectre, Team Gravity and The Dead Generation all sit right in the middle of the table - but they are not far away from quickly moving upwards in the league. With 4-2, 4-3 and 3-4 match scores respectively these are all teams who you should be rooting for to make a comeback in the second half of the season - if that's what you're into. Group D - the Group of those yet to be defeated. Another group which is extremely close is Group D - with second and third place yet to play 1-2 matches for the first half of the season respectively, we again see the top 5-7 teams still within reaching distance of the playoffs. Alien Invasion are a team with a solid roster. With the ability to call upon Strelok, Chubz, CPU, Hanfy, Revenge and others it is unsurprising to see them at the top of the table. A few came close to over-running them - Derava Kapsa, Vega Squadron and surprisingly ECVisualize all forced AI into an ace-match - but no to avail. Alien Invasion have stood strong and with their wide range of players they can call out it's going to be difficult to stop them in the near future. Of course when there are three teams yet to be defeated, that means they are yet to play each other. Mouse Control and Core Community will both have their eyes wide open at an opportunity to derail each other and to scrap it out over 1st, 2nd and 3rd positions. Just behind the undefeated we have 4 teams who look to overtake for an opportunity to play in the playoffs. Considering Core Community still have 2 of their first-half games to play; all of these teams have the playoffs in their sites as they begin their campaigns into the second half of the season. Vega Squadron and Russian Universe of Warhammer and the two who initially sit up and look as though they will be the ones to be the leading pack of this chase. Both teams are similar in the way in which their rosters look. Both have a huge range of GM and High-Master players who can come out and take any number of games. Both have one or two players who are well known, such as AlastOr for Vega Squadron and Satiini/sYz for RuW. Both of these teams have the ability to win all of their remaining games - but they also have the ability to drop games which sometimes they shouldn't. RuW have lose to the 6th and 7th placed teams, even though they defeated Vega Squadron on their travels. With the top 3 teams yet to play against them, the road for RuW is tough but not impossible. For Vega they have seen losses to RuW and Alien Invasion - which means their path ahead is theoretically a little bit easier for them. Though the odds favour Vega Squadron the team we actually see making a successful chase could be either, or even both. eSuba's Academy and Derava Kapsa are two Czech teams who are unlikely to make the playoffs at this point but are not unknown to cause upsets. Both have taken victories off of teams higher than them in the league and maybe with a bit of luck and some great games we will see one of these teams make a serious strive towards the playoff qualification zone. ZOWIE GEAR Sponsors the SC2Improve Team League Season One. The first half of the SC2Improve Team League Season One has been an absolute blast. We've seen all-kills, upsets and magnificent games. The second half is only going to get better as we see everything we have seen previously as well as the way in which the groups are going to develop heading towards the playoffs. Official SC2ITL Broadcasts will be taking place on the SC2Improve Channel : http://twitch.tv/wardiii as often as possible. A lot of games are also covered on other streams and your best bet to be able to catch these is to follow us on Twitter and to watch for re-tweets of matches taking place. Good luck to all our teams participating and let the second half of the Season commence!